Day 2 of the 10 Days Uganda Community & Cultural Tour- South Western Uganda: Transfer to Fort portal & afternoon Fort Portal Crater Lake hike, visit the Amabere g’ Nnyinamwiru caves, Visit to Karambi tombs, Tooro King’s Palace. Day 6 of the 10 Days Uganda Community & Cultural Tour- South Western Uganda: Do gorilla trekking & an evening Cultural encounter with the Batwa Communities. Day 8 of the 10 Days Uganda Community & Cultural Tour- South Western Uganda: Transfer to Mbarara town & Afternoon Visit to the Banyankole Cultural sites. Day 9 of the 10 Days Uganda Community & Cultural Tour- South Western Uganda: Early morning transfer to Nshenyi Village & Do Community tour. Day 10 of the 10 Days Uganda Community & Cultural Tour- South Western Uganda: Transfer to Kampala with enrounte stopover at Uganda Equator, Mpambire drum Makers & Departure. Upon arrival at Entebbe International Airport, you will be welcomed by our driver guide and then be transferred to your pre-booked hotel/Lodge in Kampala for dinner and overnight stay. Day 2 of the 10 Days Uganda Community & Cultural Tour- South Western Uganda: Transfer to Fort portal with an enroute visit to Nakayima tree & afternoon Fort Portal Crater Lake hike, visit the Amabere g’ Nnyinamwiru caves. 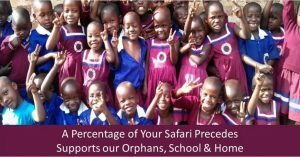 Following an early morning breakfast, depart Kampala driving on the south western direction to Fort Portal 332km about 4-5 hours’ drive. The overland journey will take you through the most magnificent landscape and beautiful local Ugandans. 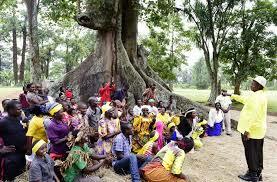 Have a stopover in Mubende to visit Nakayima tree. Here you will be narrated the fascinating tales about the history of this impressive tree with cultural connection to the Buganda culture. 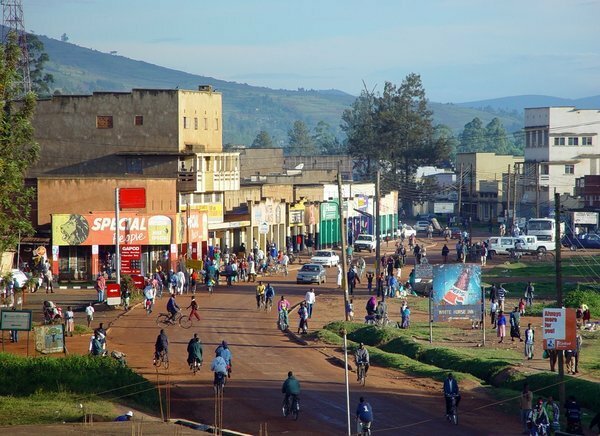 Afterwards, advance to Fort Portal town and on arrival to the town dubbed to be Uganda’s tourism town, have stopover for lunch after which you will continue to do the Fort Portal Crater Lake Hike to gain impressive views of the Fort Portal explosion crater. You will also visit the Amabere g’ Nnyinamwiru caves with a magical Nyakasura River falling over them forming beautiful water fall. The caves have breast like features which the locals attach a great cultural connotation and are thought to date back to the Chwezi era. Afterwards, proceed to visit the Karambi tombs and the Tooro King’s palace. Retreat from the activity and get to the lodge for dinner and overnight. 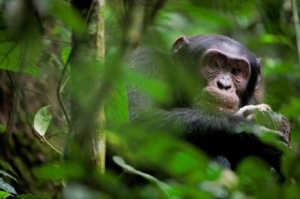 Day 3 of the 10 Days Uganda Community & Cultural Tour- South Western Uganda: Do morning Chimpanzee trekking &Bigodi wetland walk in the afternoon. After early morning breakfast, report to the park head Quarters at Kanyanchu tourism Centre for an early morning registration and briefing about the dos and don’ts of chimpanzee trekking in the forest trails of Kibale forest national park. After briefing, UWA Park ranger guide will lead you to the forest trails heads to enter the forest to start searching for the chimps in their natural Habitat. The trek will expose you to stunning flora as well as other primate species such as black and white colobus monkey, blue monkey, grey cheeked mangabey, red tailed monkey, olive baboon, bush baby and potto. After 2-5 hours trek,you will come up-close to the chimps and once up-close, you will be allowed to spend one hour with these charming primates. The Chimpanzees will lure you in a state of amazement as they swing through the branches, make pant hooting calls, play with each other, and imitate your body language along with other features that will make your one full hour with them a memorable experience of its own. Retreat from the activity to your lodge for relaxation and lunch. After lunch, transfer to Bigodi wetland sanctuary for an afternoon tour. The Bigodi wetland, lies in close distance to the park thus connecting there is less hectic. The Bigodi wetland walk will expose you to typical eco –tourism encounter in Uganda. The attractive flora and fauna existing along with the local community is indeed rewarding to encounter. The sights of great blue turaco and the Sitatunga may not be missed. You will also take community walk to interact with the local communities living around Kibale forest national park, visit community schools, craft shops and also enjoy the local women groups when they are weaving art and craft materials. Retreat from the activity back to lodge for relaxation, dinner and overnight. Right after taking a cup of coffee in the morning, depart Kibale forest national park heading to Queen Elizabeth National Park .The scenic drive distance of 157kms about 3 hours’ on rough road will offer you an experience of Africa roads. You will have your first stop at Rwenzori Art foundation which is the only bronze casting center in the whole of African Continent that is situated in the shadows of Rwenzori Mountains. You will participate in the wonderful process of sculpture making of which is the common activity done in the Centre. Proceed to tour the Ruboni community wax & craft center mainly to understand local traditions and the usage of local knowledge to modern development. Thereafter the activity, continue to explore the Katwe Village walk. The walk will lead you to a traditional homestead where you will be introduced to traditional activities like cooking the region’s cuisine, fetching fire wood, peeling bananas, and constructing sheds among others. You will enjoy traditional lunch here and in the afternoon head to explore the Nyanz’ibiri Cave Community. At this community site also known as The Cave, you will admire panoramic views of volcanic crater lakes, Paddle a canoe, hike to the Transparent Lake, spot eight species of forest primates, or just stop and smell the local flowers, visit the Cultural Museum which is a perfectly preserved Banyaruguru hut, filled with valued local artifacts that were once the tools of everyday life of the local people. Thereafter, connect to your pre-booked lodge in Queen Elizabeth National park for relaxation, dinner and overnight. 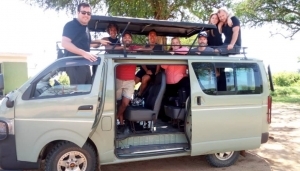 After your early morning cup of coffee, like at 6:00am, embark on thrilling game drive in the rolling savannah plains of Queen Elizabeth National Park. The drive will take you through Kasenyi tracks with the opportunities of meeting the nocturnal wildlife species when they are retreating back to their hiding grounds and also meet the early morning risers when they are starting their daily activities of looking for food. The ranges of wild game which may be seen during the game drive include the elusive leopard, defassa waterbuck, Uganda kob, Side stripped Jackal; Oribis elephants, lions, buffaloes, Antelopes among others. The tracks are well designed to increase your possibilities of encountering wild game in their natural habitat of Queen Elizabeth National Park. After 3 -4 hours game drives; embark on the drive to Bwindi Impenetrable National Park. The drive will take you through the Ishasha sector where you will have possibilities of encountering tree climbing lions that tend to lie on the branches of fig trees. The drive also exposes you to other wildlife. Continue on the drive to Bwindi Impenetrable National Park arriving in the evening for relaxation, dinner and overnight. 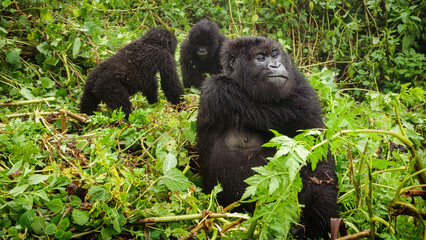 Right after an early morning breakfast, you will proceed to the Park headquarters for registration and join other trekkers in an early morning briefing about the etiquettes of Gorilla Trekking at Bwindi Impenetrable National Park. As soon as the briefing is done, you will enter the jungle to trek through thick creepers and undergrowth with your guides to find the Gorillas. The trek may take you between 2-8 hours to encounter the Mountain gorillas and this will mainly depend on the movement of the apes. The steeply forested landscape is incredibly dense but crisscrossed by numerous animal trails allowing access to tourists. Once up-close to the apes, you will be given one magical hour to View and interact with these stunning apes plus taking photographs. Retire back to the starting point after the one hour and proceed to your lodge for a late lunch and relaxation. After relaxation, you will be driven to the nearby Batwa community for memorable, refreshing cultural encounter. Here you will be guided by a local guide who will take you to the different communities to see how people have managed to survive through farming. You may visit traditional heal and enjoy his activities of healing, interact with local Batwa community. You will see how local brew is processed from fresh Bananas and forest remedies to get beer and Waragi and also enjoy the performances done by the local Batwa women groups. After that interesting cultural encounter, you will drive back to your respective lodge for dinner and overnight. After an early morning breakfast, embark on transfer from Bwindi Impenetrable national park to Kabale town. The overland drive journey of 110kms will take you through rolling winding hills and scenic landscape of south western Uganda. You will visit Kigwara cultural site -believed to be the home of Bunyoro cultural music, Munsa Fort, an archaeological site for Uganda’s history dating back to between the 10th and 17th Century. Munsa is on a hill and features trenches, caves and underground containers carved out of stone. You may also visit other interesting sites like Kakumiro, which houses the tomb of Duhaga, one of the early kings of Bunyoro as well as Masaka historical site, located in Nalweyo in Bugangaizi County which contains the tomb of Omukama Yosiya Kitahimbwa. 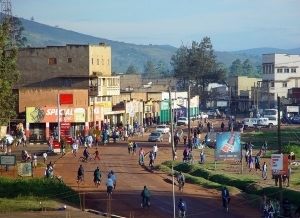 After exploring suc interesting sites,you will connect to your pre-booked lodge in Kabale town for dinner and overnight stay. Accommodation: Jopfan Country Hotel (UP-Market/Luxury) Cephas Inn (Mid-range), Skyline Hotel (Budget/Basic). Right after an early morning breakfast, you will embark on an early morning dive to Nshenyi Village. The route from Mbarara to Nshenyi Village will offer you a breathtaking view of the “million” hills. On arrival to Nshenyi Cultural Village, you will go on nature walks, visit various homesteads, be entertained by traditional dancers at the cultural village or at one of the homes in the community and experience the pastoralist lifestyle. You will also visit some of the local schools as well as walk through the local markets and visit with the Batwa pottery makers. Thereafter, return to Mbarara town for relaxation, dinner and overnight stay. Following an early morning breakfast, embark on drive transfer back to the Kampala capital City. Along the way, you will have stopover at the Uganda Equator at Kayabwe where you will have an opportunity to stand in 2 hemispheres at the same time and take some photographs, Buy some crafts as souvenirs and also stop at the Mpambire drum village for drumming session. Thereafter, proceed to Kampala and on arrival, you will have your lunch and afterwards be transferred to Entebbe international airport for your scheduled flight back home.